UPPER WEST SIDE — Toward the end of the school day on a recent sunny Friday, a group of students quietly clacked away at their laptops — dreaming up marketing plans, designing logos, editing music and writing lyrics. The middle school students, between 11 and 14 years old, are part of a brand-new class at the West Prep Academy on West 105th Street called "Become a Recording Artist" that covers the full spectrum of the music industry. The course was dreamed up by school coordinator Adam Kearns, who has experience on the management side of the recording business and who brought the idea to Principal Carland Washington. "Something I'm really serious about is giving kids choice," Washington said, and a class that taught "the ins and outs of the whole music career" seemed like one many students might be drawn to. The 15 students who signed up for the course, which launched at the end of January, took on roles not just as artists, but as producers and managers, Kearns explained. The syllabus takes a soup-to-nuts approach to the music industry, leading students through every step of the process — from dreaming up to making and promoting a record, on both the artistic and business sides, he said. So far, the students have learned about the legal side of releasing original music, social media strategy and marketing schemes, among other topics. "A big thing they're learning is time management and also how to create a business structure," Kearns said. 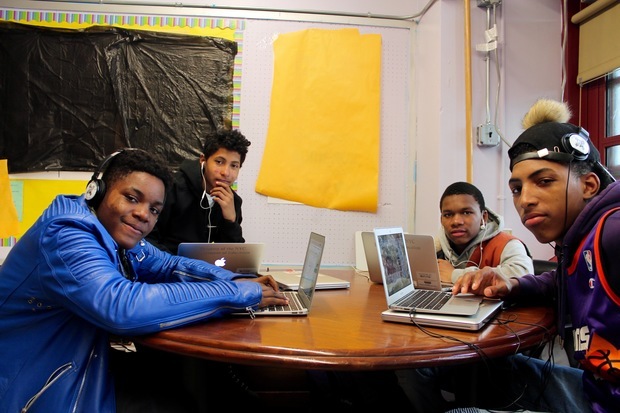 It's nearly crunch time, too, because the students want to show off the six-track EP they're making at West Prep's annual school-wide cabaret on May 26, he said. During a recent class, a 13-year-old student named Anthony was working as a producer for his classmate, creating some beats over which his classmate could rap, he said. The process is lengthy and takes dedication, but it's also an outlet for "my emotions and feelings about my life," Anthony said. For another student, Damari, 14, writing hip-hop lyrics gave him a chance to express himself. "I don't get to say much in school," he said. "This class lets me say everything." He was busy writing a song around multiple themes, including getting unfairly judged by police on the street, he said. The content of the lyrics doesn't always come up in the classroom, Kearns noted. "It's great to hear their stories. They're telling it through the music," he said. For Nyshaw, 13, who is working as Damari's manager and trying to keep him on on a production timetable, a trip to Harvard University got him really excited. The class recently visited Harvard's Hutchins Center Hip Hop Archive and Research Center, an experience Kearns called "mind-blowing." The students were enthralled by the music on display, including everyone from Nas and Lauryn Hill to A Tribe Called Quest, as well as with the museum's DJ setup featuring turntables and a mixer, he said. But running into Travis Scott, a rapper and producer who's worked with Kanye West, made the entire trip for the students, Kearns added. They met at a campus bookstore and chatted for a bit while posing for a photo. With the students' enthusiasm and positivity pouring over into different arenas and school subjects, Kearns is already planning to offer the elective again next year, he said.